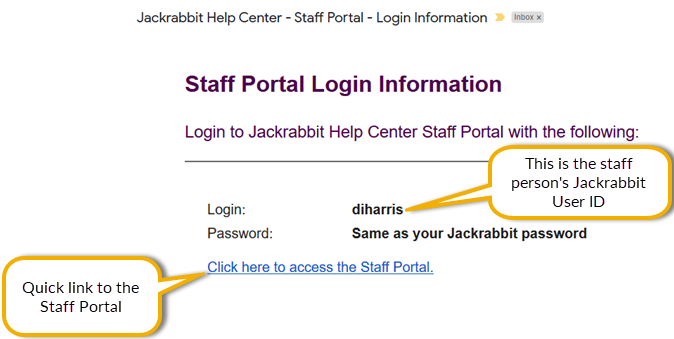 The third step of the Staff Portal Guided Setup will send selected staff an email containing staff portal login information. The email will be sent to the email address on the Summary tab of their Staff record. Different emails are sent based on whether the staff person was assigned a Portal Login ID or if their User ID was matched to their staff record. Select the Staff you want to send the email to. Click SEND PORTAL LOGIN EMAIL. Note: At this point you can opt to leave the setup and continue at a later time if desired. Click GO TO STEP 4: STAFF SETTINGS → to advance to the next step. 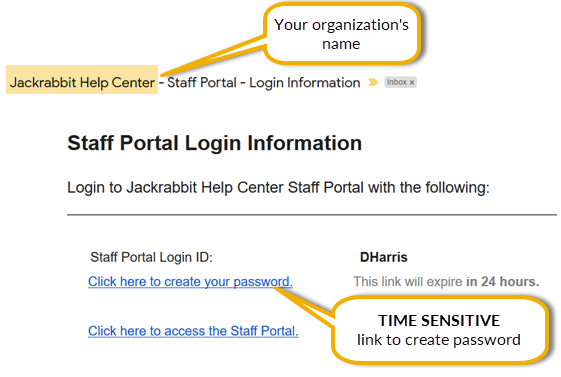 See Staff Portal Setup Step 4 - Customize Staff Settings. The link to create the password is time sensitive and expires in 24 hours.